The average price of cannabis was $6.83 per gram, based on the information submitted by Canadians to the StatsCannabis crowdsourcing application from January 25 to February 28, 2018. This estimate includes prices from $2 per gram to $20 per gram; prices outside this range were treated as outliers. 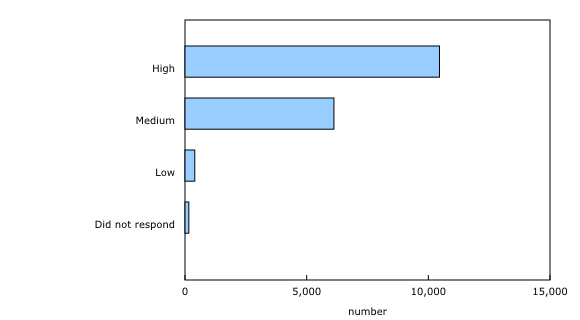 Caution must be exercised when interpreting these data because the sample is self-selected and therefore subject to many kinds of statistical bias. Results for the entire target population, consisting of all Canadians who consumed cannabis during this five-week period, could be significantly different. These results are based on 17,139 responses that were provided as of Wednesday, February 28, 2018. Canadians reported that the average price of cannabis in February was $6.83. 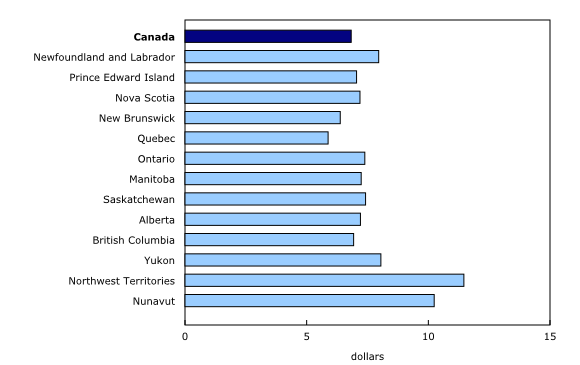 Prices varied across regions with prices in Quebec and New Brunswick below the national average and prices in all other provinces and territories above the national average. Average prices were particularly high in the territories. Canadians also reported that the greater the volume of cannabis purchased the lower the price. 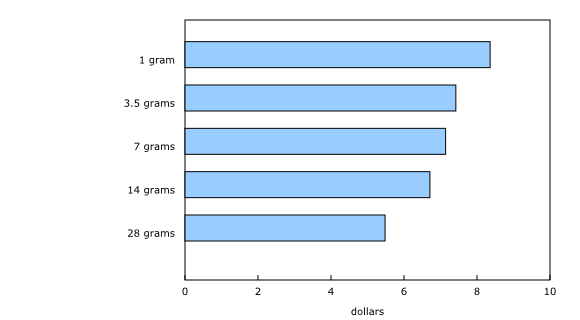 The average price reported by Canadians who purchased 1 gram was $8.36 per gram, whereas price per gram was $5.48 for a purchase of 28 grams. Similarly, there were price differentials according to use. 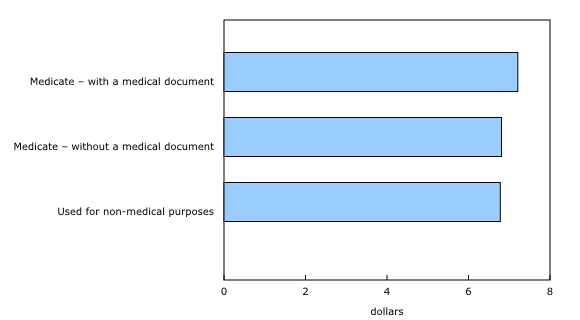 The average price of cannabis used for medical purposes with a medical document was $7.21, whereas the average price of cannabis used for non-medical purposes was $6.78. Respondents reported that, in the vast majority of cases, they consumed cannabis for non-medical purposes, although at this time such consumption is illegal. Around two-thirds (63%) of respondents reported using cannabis for non-medical purposes. 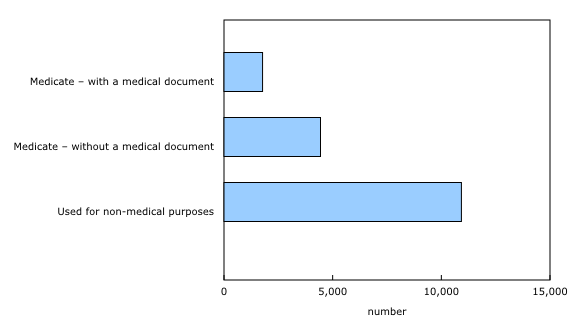 Interestingly, more individuals reported consuming cannabis for medical purposes without a document (26%)—that is, illegally—than with a document (10%). Canadians were asked to report if they use cannabis on a daily, weekly, monthly or annual basis. The majority of Canadians who reported information indicated that they consume cannabis on a daily basis. This estimate, like the others reported here, applies only to the individuals who reported data on the crowdsourcing application and does not apply to the entire population of cannabis consumers. The individuals who reported daily use indicated that they consume an estimated 28.0 grams of cannabis per month, about one gram per day. Individuals who consume less than once per day indicated that they consume 6.3 grams of cannabis per month. The prices paid by individuals reporting daily use was $6.54, while the price paid by individuals reporting monthly use was $7.32. 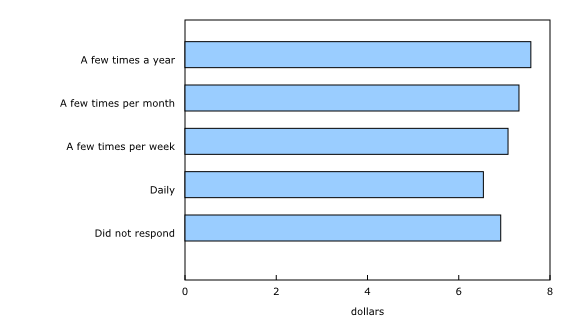 The lower price paid by daily users may be an indication that they are purchasing larger volumes which have a price discount. Canadians were asked to report the quality of the cannabis they purchased. This was a self-assessment where individuals were asked to report if they purchased high quality, medium quality or low quality cannabis. The majority of respondents (61%) indicated purchasing high quality cannabis. Very few Canadians indicated they were purchasing low quality cannabis. The results were consistent from one province to another. We would like to thank Canadians for their continued support in helping Statistics Canada measure the evolving social and economic impacts related to the legalization of cannabis. We ask that you continue to submit information to the StatsCannabis crowdsourcing application so that we can create a rich open set of data all Canadians will be able to use to better understand the transition towards legalization. The information posted by Canadians during the period of January 25 to February 28 is now downloadable from the application. The product Cannabis Stats Hub (Catalogue number13-610-X) is available.